How to run a Cricket Farm for Carpenters? Granted, I once raised black field crickets, but they took only 2.5 weeks to hatch. I let the females lay in regular soil (I didn't have anything fancy and sterile to work with at the time). I just made sure the dirt stayed damp, and I kept it in an old Noosa yogurt bowl with the lid on and holes poked in for air. My advice: gently dig and look for the eggs. They look like very very tiny rice. About the size of a dandelion seed, if you want a comparison. Hopefully they'll still look white-ish and healthy. If brown or obviously mushy, or you don't see them at all, then yeah you might have lost them. Edited by CampoKing, December 8 2018 - 8:04 PM. I looked through my journal, eggs were laid in my R. metallica tub on the 23rd October and the days following, about 3 days ago I transferred the R. metallica colony and there were a few pinhead sized crickets in the enclosure. It had been cold up until the last week so I'd say the burst of 30c+ heat made them hatch, that would mean about 5 weeks or so at between 15 and 20c with a burst of 30+ (ambient temperature next to the colony 31+ for a couple of days). That's only based on the pinheads size, there was no vegetable matter or food specifically for crickets given, the crickets might have been older than they looked but I assume that they hatched when it was hot. I had thought about 2 weeks with heating but perhaps wait a little longer. Edited by DaveJay, December 8 2018 - 8:23 PM. I keep hearing 7-10 days at 30C degrees, so even at 4x slower it would be 40 days at most. Because of a disease we use a different species of cricket than America and Europe do now, so that might make a slight difference. That's about what I've always understood it to be. Here's a video I watched a while back on a forum, can't remember which one but I found it on youtube. The ones in the test tube I can see so there is hope there. I have another batch in vermiculite, which the females were laying a bunch last night due to the warm and humid day. Edited by CoolColJ, December 10 2018 - 2:23 PM. Next batch should go well, hopefully. I see a ton of eggs in the small 5x3x1.5 inch tupperware style container I used with vermiculite. Against the side of the container from top to bottom on all sides. I did leave it in there for 3 weeks. At least I can see the eggs, so can keep track of development. Vermiculte seems much better the coco coir. Holds moisture better. Edited by CoolColJ, December 15 2018 - 2:34 PM. My female crickets are starting to die off. Guess I better put in a new tray to get as many eggs before they all die off! Well the last female died a few days ago. I have a new batch of 190 or so small crickets, after a few died. Should have at least 100 left by the time they become adults. meanwhile my feed roaches of 40 or adults have over 200 babies! Edited by CoolColJ, January 11 2019 - 10:32 PM. I solved the issue of the subtstrate going moldy from cricket poop, which also causes the eggs to go moldy. This keeps the subtrate moist and the cricket poop from touching the substrate! The crickets can poke holes into the paper when laying eggs just fine. Edited by CoolColJ, February 13 2019 - 2:22 PM. 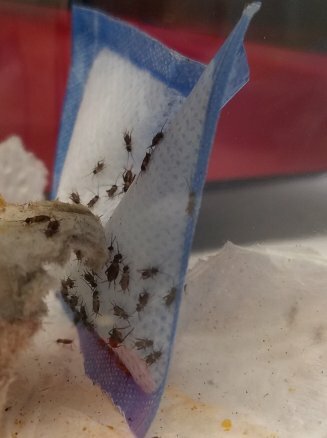 I'm trying to hatch some feeder cricket eggs myself, after letting the adult females that arrived in the mail lay all their eggs for a couple days.. I'll let you know how that goes. I really should be seeing something hatch this week. I think eggs were laid around February 1. Edited by CoolColJ, February 13 2019 - 2:21 PM. I had the egg bins covered with folded kitchen towel and cling wrap plastic over this, both covering 90% of the top leaving a slight gap. Placed both my containers inside the hatching container with toilet rolls and paper towel covering the floor. First container, the crickets laid over just one day. By then the females were so plump and round from all the eggs they were carrying. The key was the flywire screen which prevented the crickets laying the eggs against the side which tend to die and go moldy. I also picked out all the poop and any vermiculite with poop, and sign of hairy mold. After that no more mold. The second container I let them lay over a week, but by then not many crickets left. This one I placed the wet tissue paper under the flywire screen, and that stopped the poop touching the vermiculite. I changed this everyday, and the crickets poked holes through it to lay eggs just fine. This container should start hatching 2-3 days from now as I did not keep it heated after the first few days.